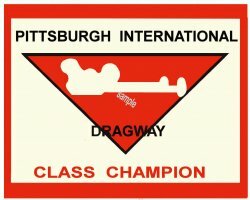 Pittsburgh International Dragway - $10.00 : Bob Hoyts Classic Inspection Stickers, Add a Final Touch to your Restoration! This sticker is a for the Pittsburgh International Dragway decal. We do not know the dates that this dragstrip existed, please let us know. It is approximately three inches long and two inches wide and has our patented "Peel and Stick" format that allows it to be attached to the inside window of your classic car.